For get about the iPod! This MP3 player is going where no MP3 players have gone! iRiver and Diver Entertainment Systems announced the H2O Audio DV series that builds on iRiver’s iFP-300T series flash player only these players are fully submersible to depths of up to 200 feet! 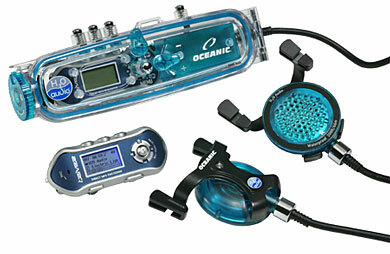 Now you can listen to Britney Spears while SCUBA diving, snorkeling, free diving or any other active water sports. The H2O Audio DV series feature up to 512MB of storage capable of holding over 16 hours of music and provide up to 24 hours of battery life using one AA and one 9V battery… so you’ll be out of air before the underwater party music ends. The player comes with accessories including, underwater earphones, high-quality earphones, fastening clip, maintenance kit, user manuals, software CD, USB Cable, line-in cable and 9V and AA batteries. A bit pricey, they range from $350 for the 256mb model to $649 for the 512mb one. You can preorder one from Oceanic Pro. The Only High Capacity Media Player Made in the USA?